Brunswick Bound is an independent bookstore in the heart of Sydney Road, Brunswick. Alice Robinson has had fiction, essays and review published widely in literary journals including Kill Your Darlings, The Lifted Brow, Overland, TEXT, Firefles, Arena and Meanjin. Her debut novel Anchor Point was longlisted for The Stella Prize and the Indie Book Awards in 2016. She has a Bachelor of Creative Arts from The University of Melbourne and a PhD in Creative Writing from Victoria University, where she was award the Vice Chancellor's Award for Research and Research Training. Alice lives in Warragul with her family. 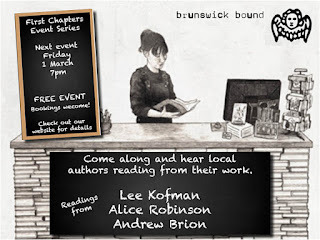 She will be reading at First Chapters on Friday 1 March from her novelThe Glad Shout. 1. Brunswick Bound has asked you to read a piece from your published work. Tell us what we can expect from the piece you have chosen? Andrew Brion came to writing poetry later in life. Andrew has published in various Melbourne magazines and has also been active in Spoken Word poetry. His writing broadly covers themes exploring our philosophical, emotional and intellectual relationship with the world; themes of travel, and contemporary themes including politics. He grew up in the north of England and now lives in Melbourne. Andrew will be reading for us at First Chapters on Friday 1 March from his first book of poetry Soul Moves. We asked him a few questions to get to know him better. Here's what he had to say. 1.Brunswick Bound has asked you to read a piece from your published work. Tell us what we can expect from the piece you have chosen? I’ll probably read some poems from my book, Soul Moves. I expect to read some poems on the theme of migration. These would largely reflect the tensions and loves of the emigrant/immigrant which push and pull between two countries.